Mark 7:37 states, “he hath done all things well….” God does all things well! We are so thankful that He has saved us, and chosen to use us in His ministry. These past couple of months have been some of the busiest in both the family realm as well as the ministry overall. We are grateful that God is omnipotent, and yet still intimately aware of who we are and all that we do. 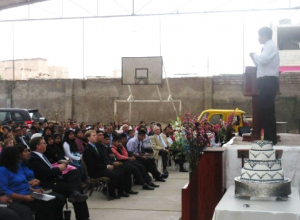 The week of May 17th through the 21st, Efata Baptist Church celebrated our 40th anniversary. What a great event that was. Evangelist Jim Sloan, Missionary John Olson and Pastor Joe Davis came and were such a blessing to us. Several of our missionaries attended, as well as many deaf and hearing folks who have been or are connected to our ministry. People came from our mission works in Callao and Tablada as well. On Sunday, we had over 540 people in attendance. It was a wonderful time of remembrance and vision casting for the future. On a bittersweet note, the founder’s wife Velma Miller went home to be with the Lord the Sunday prior, which was Mother’s Day. She was 91 years old and went home in peace in her sleep just as she prayed she would. Please pray for Washington and Ana, an elderly couple Lisa and I have been working with. Washington is a new Christian, and we led his wife to Christ. Pray that she would come and be baptized and attend church with her husband. They come from a strong Catholic tradition. We are planning a Bible study in their home. Pray that they respond. 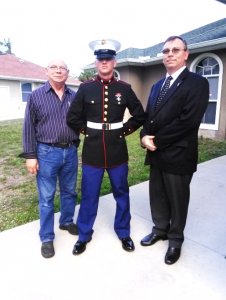 Lisa and I were recently in the States to attended our son Judson’s graduation from Marine Corps. Boot Camp (More about that below). While there we had the privilege to report to several of our supporting churches along the way. It was so good to see them and reacquaint with them. Thank you for your hospitality and care. PLEASE NOTE: We are planning our first extended furlough for 2018. We have not been on furlough in six years and have not been on furlough longer than five months for almost 12 years. We recently changed our Peruvian immigration status to allow us to be out of the country for a full year without consequence. We look forward to seeing as many of you as possible. I will begin calling soon. If you would like to have us for your mission conference or for a Sunday, please email me or call me to coordinate. If you do not hear from me in the next few months, please contact me. I may have not been able to get a hold of you due to old or lost contact information. As I mentioned above, Judson just graduated Marine Corps Boot Camp on Paris Island, NC. We are so proud of him. He just finished infantry training (Every Marine is a Rifleman first!). He is now stationed at 29 Palms, California, preparing for technical school. Jared also just joined the military, and he completed Air Force Basic Training on June 2. I was with him in San Antonio, TX for the graduation ceremony. 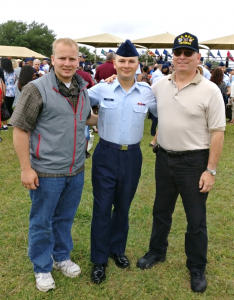 Jared will be going to Biloxi, MS for technical training at Keesler AFB. God is so good to us. All five of our children who have grown and are out of the house are serving the Lord and their country. When Judson was in boot camp, he loved going to chapel half an hour early and staying half an hour late so he could play the piano. He said it was a great stress relief. James has completed the first year of his master’s program at Baptist College of Ministry and is serving and training as a volunteer EMT. He works at the church in maintenance and security and serves as an instructor at a summer mission camp in MO. He has one more year of school, after which he plans to go on deputation. Joseph and his wife Zulema and Julianne and her husband Frank are both expecting another baby (October and December respectively). When born, that will make five wonderful grandchildren for us! I am praying for some granddaughters to spoil! Our five children at home, Joy (16), John (13), Joel (11), Jessica (9) & Jennifer (6) are all doing well, growing, helping, singing in choir, etc. We are so blessed. It’s like having a second generation of children to raise. We pray God gives us much wisdom.